April 2014—For the residents of Cleveland’s Greater University Circle, whether the Evergreen Cooperatives initiative succeeds matters a lot. Like many inner city communities around the country, Greater University Circle has been promised much and delivered little over the past decades. Over the past nine years, however, Cleveland's Greater University Circle Initiative, spearheaded by the Cleveland Foundation, has been making real strides in harnessing the power of anchor institutions to be partners in truly holistic community wealth creation. In particular, many residents of University Circle are now investing their hopes, dreams, and human capital in the Evergreen Cooperatives, one of GUC's most visible and most powerfully regenerative initiatives. While visions have transformative potential, at the most basic level, a chance for gainful, stable, and meaningful employment means everything to the people of University Circle, where the unemployment rate stands at 24 percent and the median household income is $18,500. Three years after we released our first study in May 2011, the Evergreen Cooperative Corporation has moved from the initial excitement of envisioning its possibilities to tackling the hard work of ensuring that its businesses can continue to operate in support of those possibilities. In December 2012, the parent Evergreen Cooperative Corporation finally secured its 501(c)3 status, positioning the for-profit cooperatives under its umbrella to tap into the full array of both commercial and foundation funding opportunities. The Evergreen Cooperative Development Fund, which was formerly managed externally, is now being brought in house. The ECC’S board of directors now represents a cross section of influential University Circle civic and business leaders, including representatives of the neighborhood’s major anchor institutions. 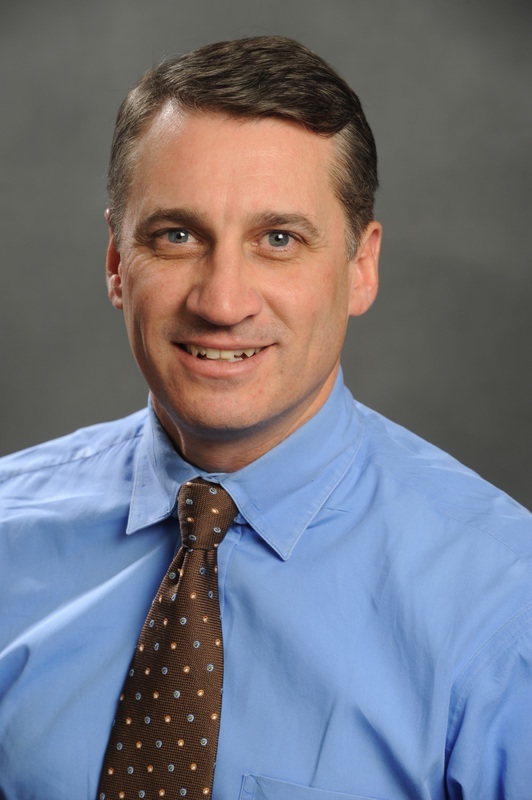 A carefully crafted governance structure has been put in place, and after a national search, John McMicken, a local former entrepreneur who was originally hired as a consultant to Evergreen, has become its first CEO. Evergreen’s three existing cooperative businesses are now led by seasoned CEOs with years of experience in their respective industries. And after struggling for a number of years to turn a profit, the Evergreen Cooperative Laundry and Evergreen Energy Solutions are reliably in the black. However, the newest cooperative, Green City Growers has not yet reached breakeven. Evergreen has also implemented a number of path-breaking, long-term wealth-generating strategies for worker owners. How Evergreen continues to evolve and how successful it will be in staying true to its regenerative goals over the longer term, operating as it must within the often cruel constraints of the current market economy and in no way immune to the consequences of human error, will be a story we will continue to chronicle. Indeed, it is the unfolding story of all the regenerative projects that make up our Field Guide narrative. Over the past three years, Evergreen project leaders have been focused on shoring up the Evergreen Cooperation Corporation as the keeper of the vision with a strong board and governance structure. 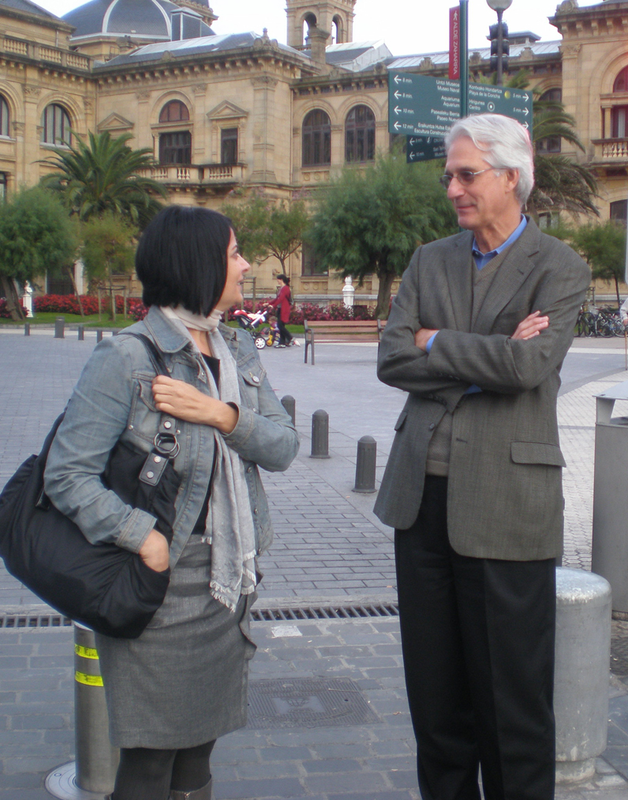 “Our goal was to make the necessary adjustments to the reporting relationships between the businesses and ECC,” notes Lillian Kuri, Program Director for Architecture, Urban Design and Sustainable Development at the Cleveland Foundation. To support Evergreen’s mission of transforming Cleveland’s low-income communities, and as part of the Greater University Circle Initiative, ambitious three year goals were set by the participating anchor institutions that now sit on the Evergreen board. Priorities include targeted stabilization projects in three neighborhoods, expanded economic inclusion and workforce programs, attracting new businesses and jobs into Cleveland’s Health Tech Corridor zone, and expanding a broad-based community engagement program. In October 2013, the “Charter” committee of the ECC board designed a new governance framework that ensures close financial oversight of Evergreen businesses in their startup years, before they reach financial stability. Thereafter, after they move into profitability, financial decision-making is gradually turned over to the businesses. However, under this governance structure, businesses will continue to report to the central board on all “mission critical” decisions. Evergreen has also begun to fine tune the allocation of capital to the profit sharing accounts of worker owners. After taking a poll of worker owners, the probationary period during which an employee is not yet eligible to share in worker owner profits has been extended to a year from six months. At the same time, Evergreen is wrestling with worker owner’s needs and desires to realize some of their profit-sharing wealth earlier on. Currently worker owners cannot access their capital accounts until they leave or retire. Alternatively, Evergreen is considering other formulas, such as paying out a portion of the annual capital account allocation as a year-end bonus. Another Evergreen asset building program enables coop members to purchase new automobiles at discounted rates so that they have reliable transportation. To date, three employees are in the auto program with another 10 coming into the program in round two. Evergreen is also attempting to make good on its goal to promote from within. 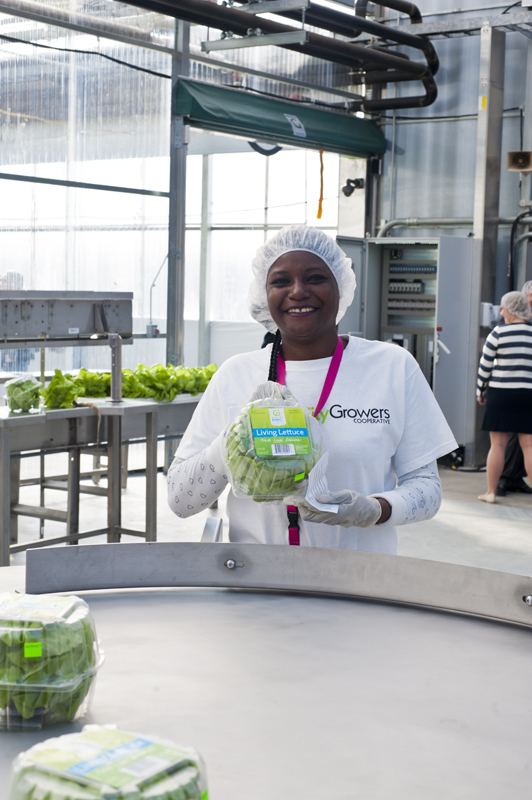 All supervisory personnel are former workers, with the exception of the newly launched greenhouse, where one of the first employees was recently promoted to a shift manager. Evergreen’s supervisory training program includes conflict management, and training in reading and analyzing balance sheets and income statements. “The training environment has helped us a lot to identify leaders and to give them a better chance of succeeding,” says McMicken. For the past three years, the National Development Council has overseen the Evergreen Cooperative Development Fund. However, beginning in 2014 with a new management team and board of directors in place, oversight of the fund will be brought in house. “It is alive and well and functioning, and has really served its purpose bridging the gap of working capital to get businesses turned around,” says McMicken. Evergreen plans to hire a fund manager who will work along side the ECC finance committee to raise capital and approve disbursements. In the short-term no major fundraising efforts to capitalize new businesses are afoot, as Evergreen focuses on stabilizing its current businesses. However, Evergreen has recently been the recipient of two, five-year loans in the amount of $150,000 each, extended at below market rates by high net worth individuals with close ties to Cleveland. The hope is that more “friends of Cleveland” can be identified who will invest in Evergreen to help revitalize the region. In the early years of Evergreen, University Hospitals, Case Western, and The Cleveland Clinic each contributed $250,000 in grant money to Evergreen. Last year University Hospitals and Case Western University made further grant commitments of $1 million and $500,000, respectively, to provide working capital and to fund the overall ECC structure and the services it provides (such as training) to the operating companies. Although it now appears that all three cooperative businesses are poised for long-term sustainability, Evergreen leaders candidly admit that mistakes have been made along the way that have been costly in both human and financial terms. For example, the laundry’s capitalization budget represented a huge upfront cost to the organization, and when the contracts that were anticipated from anchor institutions failed to materialize as expected the laundry operated under capacity for a number of years and in the red. The misalignment of labor costs and pricing structures exacerbated the problem. In November 2012, a new CEO with deep industry experience was hired by Evergreen to bring the laundry back from the brink. “He made a lot of cuts that were painful but the combination of those cuts and renegotiating the pricing on our contracts stopped the bleeding and put us on the road to success,” says Howard. McMicken reports that the laundry has turned the corner on profitability and entered the second quarter of 2014 in the black, having landed a major anchor institution contract. It now employs 45 and is expected to hire 5 new workers in 2014, for a total of 50 employees--the maximum number envisioned in the laundry’s original business plan. Evergreen Energy Solutions (E2S) has also undergone an evolution as the solar market has changed in the past few years. To smooth out the earnings volatility associated with the underlying volatility of the solar sector, the cooperative (formerly Ohio Cooperative Solar) has diversified into home weatherization, housing rehab and LED lighting projects, both retrofits and new construction. The latter are now the fastest growing segments of the coop’s business. E2S continues to build solar arrays, including a large installation on the new student center at Case Western Reserve University and a high-profile 1-megawatt, ground-mounted solar array for a utility company that provides energy to the nonprofit institutions of University Circle. The array is located along Euclid Avenue, Cleveland’s main thoroughfare, at the former site of a condemned factory building. Most of the construction material was repurposed into the site and Brownfield remediation undertaken. University Hospitals and Case Western, the two principal owners of the utility, were motivated by other than purely financial considerations to achieve renewable energy consumption targets. At a time when solar power is unable to compete on a dollar basis with coal-powered energy from the regional grid, this nonfinancial incentive was key to making these projects pencil out. Evergreen’s newest venture, Green City Growers, a 3.5-acre hydroponic green house growing lettuces, herbs, and leafy greens, opened for business in December 2012. However, due to construction delays, it was unable to ship its first product until March 2013. Although the operation has worked out many of its kinks, it has failed to achieve its projected sales to date. Even when potential clients accept the Green City Growers price point, McMicken reports, there are the logistical challenges. “Short of buying our own fleet of trucks we must rely on wholesalers and food distributors,” he explains. “As a new player we run into the chicken and egg problem that we haven’t had the relationship yet, so how do we know how much the grocery store chain will buy from us in Columbus until we can get it to them?” Meanwhile, a full time sales person, hired last August, is working hard to develop a pipeline of new opportunities. Evergreen worker owners now number 28. 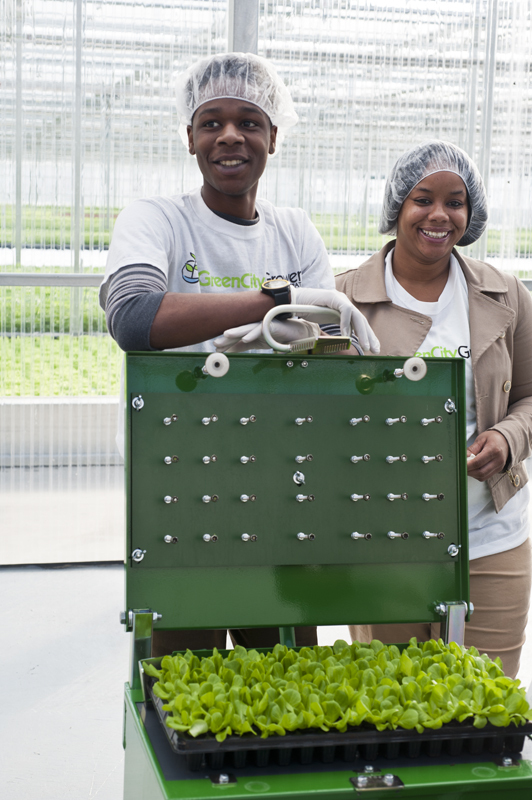 In the first quarter of 2014 an additional 10 to 12 new hires at Green City Growers will become worker owners, after completing 12 months as employees. The total number of Evergreen employees now stands at 88: 45 at the laundry, 15 at Evergreen Energy Solutions, and 28 at greenhouse. Meanwhile Evergreen continues to be closely watched by those on a mission to heal the communities of our country’s neglected, post-industrial heartland. It represents to many one of the most hopeful frameworks for resuscitating an economic democracy now on life support. Ted Howard reports that great interest in Evergreen continues to build around the country, from the Atlanta Wealth Building Initiative, the Wellspring Cooperative Collaborative in Springfield, Massachusetts, and civic leaders in Washington DC, Jacksonville, Florida, and New Orleans. “Evergreen represents a new vision for how we can develop our communities,” Howard notes. “What’s important is not so much the specific Evergreen structure, but the principles that infuse Evergreen. Evergreen is part of a larger community wealth building movement that is growing across the country.” The Democracy Collaborative has also created (in partnership with the Northwest Area Foundation) a Learning/Action Lab for Community Wealth Building with a consortium of Northwestern Native America groups, and has advised the State of Illinois on updating its coop laws to reflect current practices in the sector. Please share your thoughts about THE EVERGREEN COOPERATIVES here.